We have previously described use of a Balch homogenizer for the rapid, cost-effective and freeze-thaw independent homogenization of Caenorhabditis elegans (Bhaskaran, S., et al., 2011). This tool operates through shear forces generated by placing a ball bearing of known diameter within a confined chamber and then using two disposable syringes to manually advance worm samples past the micron sized gap that is formed between the chamber wall and the bearing. Using this tool we showed that worms of any developmental stage could be equally well homogenized after selecting an appropriately sized bearing to precisely control the wall-to-bearing clearance. Here we describe the use of the Balch Homogenizer for isolation of nuclei from C. elegans. Since the primary goal of this study was to identify conditions that permitted rapid, freeze-thaw independent isolation of structurally-sound nuclei from any stage of worm development, our choice of buffers as well as centrifuge spin speeds to pellet nuclei were the same as those described in the embryonic and oocyte nuclei purification protocol of Mains and McGhee (1999). In their method, several approaches to disrupt worm samples were described, including use of a vintage motorized Stansted Cell Disruptor, a French Press, sonication and a mortar & pestle. Each method had its associated limitations, ranging from cost to sample heating. We established the following protocol for nuclei extraction which is rapid, does not require prior sample freezing, and can be applied equally to all stages of nematode development. Samples of nuclei collected using this protocol have been utilized in a number of downstream applications, including preparation of nuclear extracts for use in gel shift assays. For the following protocol we utilized a mixed-stage population of SD1084 worms containing a sur-5::GFP reporter gene. 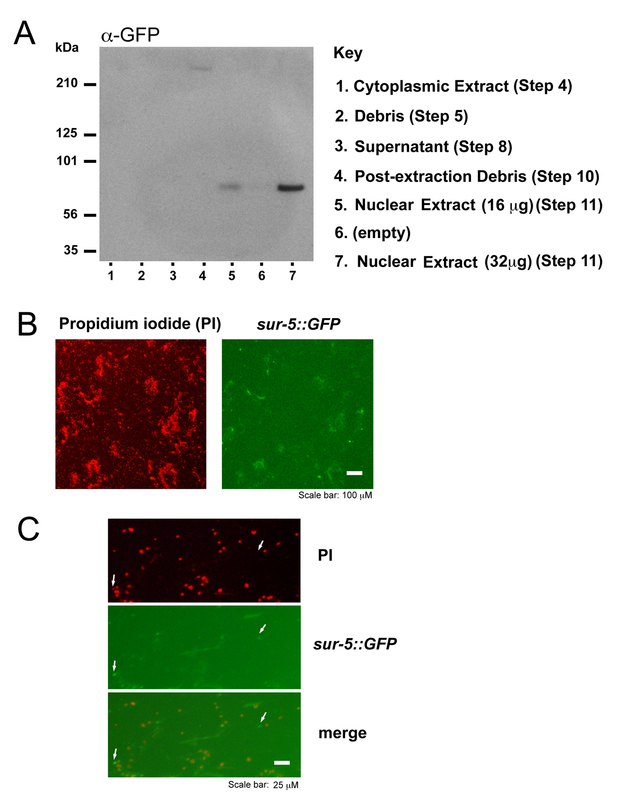 Use of this strain allowed us to monitor the degree of disruption of the nuclear membrane at each step of the protocol, as SUR-5::GFP is soluble. We have previously published ball bearing clearances required to either fracture or homogenize synchronized populations of worms at any stage of larval development [refer to Table 1 in (Bhaskaran, S., et al., 2011)]. The following protocol can therefore be easily modified to accommodate worms of any size. Nuclei in C. elegans range from ~1.8 – 7μm (Chen, L. et al., 2013). Add an equal volume of ice-cold 2xNPB to the worm pellet. To recover nuclei trapped within large debris, wash the low speed pellet twice with 5 ml 1xNPB containing 0.25% NP-40 + 0.1% Triton-X-100. To prepare a nuclear extract, re-pellet the nuclei (4000 x g, 5 minutes, 4°C). Centrifuge at 10,000 x g for 14 minutes at 4°C to pellet debris. Figure 1: Characterization of extraction fractions using immunofluorescence and western analysis. (A) α-GFP western blot of various nuclei extraction fractions obtained using SD1084 worms. (Monoclonal GFP antibody obtained from Antibodies Inc., cat# 73-131). The precise identity of the expressed SUR-5::NLS::GFP fusion protein is unknown, but its full length predicted size is 104 kDa. (Yochem, J., et al., 1998). (B) Fluorescent images of mounted extract from Step 11 showing propidium iodide (PI) positive structures and SUR-5::GFP staining. (C) Higher magnification image of PI-positive structures shown in (B). Very few structures are both PI-positive and sur-5::GFP positive (compare left and right arrows), presumably due to detergent extraction of sur-5::GFP, but their presence nonetheless underscores their nuclear origin. Chen L, Chan LL, Zhao Z, Yan H (2013). A novel cell nuclei segmentation method for 3D C. elegans embryonic time-lapse images. BMC Bioinformatics. 14, 328. Mains PE, McGhee JD (1999). Biochemistry of C. elegans. In C. elegans : a practical approach. (IA Hope, ed). Oxford: Oxford University Press. Yochem J, Gu T, Han M (1998). A new marker for mosaic analysis in Caenorhabditis elegans indicates a fusion between hyp6 and hyp7, two major components of the hypodermis. Genetics. 149, 1323-1334.